Mary Anne here. Okay, I must confess, we’re on a pear tear here at Feast on the Cheap. Having discovered that pears enhance everything from soup to Cinnamon Pear Coffee Cake, we just can’t get enough of this seasonal fruit. 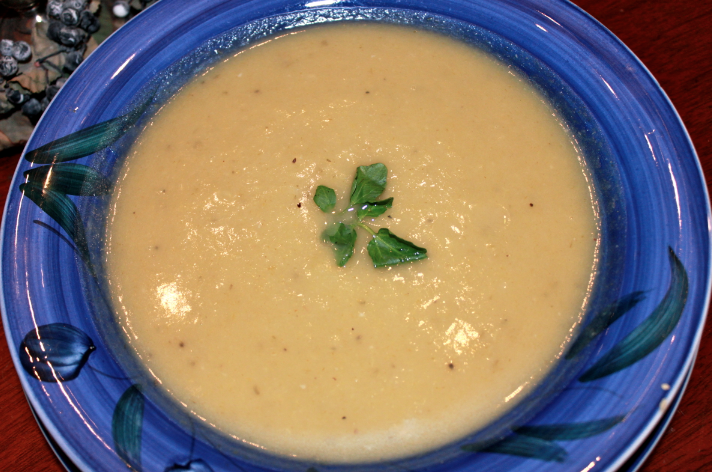 Pears add a certain je ne sais quoi to all manner of recipes, so I decided that my Leek and Potato potage might benefit from their subtle sweetness. For this creation, I used Anjou pears since they were on sale for 88 cents a pound, but don’t restrict yourself, any pear will do. As with the Acorn Squash and Pear Soup, I took the time to roast the pears, which makes all the difference in the flavor department. This time however, I cooled them in a separate bowl and I was able to see just how much juice these babies add to the pot. Most impressive. As a side note, I garnished this with far more watercress than the picture indicates. This was a tough soup to photograph and I had to resort to using the dreaded flash. While the flavor of the product is brilliant, the color…eh, not so much. Just before serving, I tossed in a handful of trimmed watercress to each bowl. The ‘cress added a delightful, peppery crunch to every bite, but if you’re plum out of the green stuff, rest assured, this soup stands alone! 1. Preheat the oven to 350 degrees. Place the pear halves, cut side up, in a baking dish large enough to accommodate. Pour 1 cup of the chicken broth around, not over the fruit. Cover the pan tightly with tin foil and bake for 1 to 1 ½ hours until the pears are fork-tender. Peel the cooked fruit or scoop out its pulp, when cool enough to handle. Reserve the cooking stock, pulp and rendered juices. 2. Meanwhile, in a large stockpot, heat the olive oil and butter over medium-high flame. Sauté the leeks and sliced onion, stirring frequently, until translucent, about 10 minutes. 3. Add the diced potatoes and garlic to the pot, and cook until just beginning to soften, about 10 minutes. Do not allow the potatoes to brown. 4. Add the remaining chicken stock, pear pulp, and the reserved pear/chicken stock. Bring to a boil and then reduce the heat. Cover and simmer gently for about 30 minutes. 5. Add the sherry, Tarragon, and salt and pepper to taste and simmer an additional 5 minutes. 6. Transfer the soup (in batches) to a food processor armed with the metal blade. Process the soup until smooth, returning each pureed batch to the soup pot. Gently reheat and correct the seasonings. Garnish individual servings with watercress, if desired. I love the roasted pears in there! I’ve been on a pear kick too. Can’t wait to try this. I think you are being too critical about the colour of your soup – it looks fabulous. Pears have just been added to the shopping list to try this yummy sounding soup, however, I don’t see the quantity of potatoes needed. Am I the only one who can’t find “potatoes” anywhere in the ingredients list? How many potatoes of approximately what size? And, forgive my ignorance, but what kind of potatoes, if it matters? I’m having a luncheon next week and I do want to serve this soup — but I’m not the kind of cook who can make it up as I go along, so I’ll need this potato advice. Mandy and Alice – thanks so much for pointing that out! Talk about omitting the obvious. So sorry, when recopying my shopping list for the website, I completely skipped the potatoes. They’re added now – 1.5 pounds of Yukon gold potatoes, peeled and diced! Currently eating this after having just made it… and it’s GREAT!. The flavors go together so wonderfully. Great with the Watercress on top; I definitely wouldn’t skip it. I’m serving it tomorrow with the Easy Whole Wheat Mac n Cheese and the Roasted Beet salad (both from this website)! I definitely recommend trying this recipe out, it is pretty easy, unique, and delicious! Trevor, we’re so glad to hear that and thank you so much for weighing in. It’s always so nice to get official feedback after readers test out a recipe! Hope you had a great weekend.